If you would rather listen to this blog post as an audio recording, press play below and I’ll read it to you! Let me start by saying this is all just advice based on my own personal experience. Over the last 17 years as a Nail Professional, a salon owner, a one man band, an educator, an educator of educators and a sub-distributor for CND’s most successful international distributor, amongst other things – I have had the opportunity to view this topic from every angle possible. I am not trained in hair, but I love having mine done, it’s my ultimate treat. Since my first professional haircut at 14 years of age I’ve been hooked. I go regularly, I pay a premium, and I love every second of the experience. I feel this provides me with an authentic client’s perspective too. I am in business in the UK, so I will be talking in GBP (£), but really I could use any currency, even a made up one, the advice would be the same. I have educated a lot of Nail Pros over the years as a CND™ Education Ambassador. When it comes to teaching business strategy and pricing, I generally find it much easier to teach a complete beginner with no experience of our industry. They are open minded to the logical approach, accept what I tell them and treat it like any other part of the curriculum. It’s something new to them and they are here to learn about it. But existing Nail Pros who come for further education are often times burdened with self doubt, have mixed up ideas they picked up from some random on a Facebook group, and are paralyzed by the fear that all their clients will leave them if they put their price up by £1 a year. A client or another Nail Pro with more experience once told them they were too expensive and they lay awake worrying about it and then dropped their prices, or are now trapped doing constant special offers. Regularly I come across extremely talented Nail Professionals who have been told by some medaling, quite possibly controlling, family member, ‘Oh luv, no one will pay as much as that, her down the road only charges X! Do you really think you are any better than her?’ ‘Ok Mum/Husband/Dad/Daughter, I suppose you are right, I better charge less, I’m probably not that good after all….’ Well I tell you dear reader, I want to go home with those Nail Pros after class and give the offending family member a piece of my mind. But being the unflappable professional I am, I just stick with a positive approach and go on encouraging my student after class by reaching out with positive feedback, facts and information. So let’s start at the beginning. A new Nail Pro has joined our mighty industry, what should they charge? Or aim to charge, after a bit of initial practice. People often ask, ‘how long should I wait before charging full price?’ It’s not a case of how long, it’s how many that matters. Say this new Nail Pro has trained in SHELLAC™. If they do an application and removal once a day for a fortnight they are most likely ready to go! If they do one set a week, and only 1 removal since their course in the space of 6 weeks, they are absolutely not ready to go. As a starting point, find out from your chosen brand’s official distributor what their lowest recommended price for the service is. Then you know that anything below that price is considered a discount service, and therefor, too cheap for the quality of that particular product and level of training. For a SHELLAC™ service including removal in the UK, according to Sweet Squared the official distributor, the lowest price that should be charged is £25.00, and I wholeheartedly agree with that. OK, you reeeally don’t need to worry about her. Just make sure your nails and the entire client experience is worlds apart from what she is offering and you’re golden. It’s that simple. Don’t ever mention her to a client and if a client talks about her, her price, or what she said about you, just smile, look slightly baffled and be like, ‘wow, is that right?’ But don’t enter into a discussion, change the subject to something funny or nice. There are people who would choose lower quality at a lower price, and that’s totally ok. But the clients you want would never dream of going somewhere charging £15, just as they wouldn’t buy perfume from a supermarket, or dye their own hair from a box. There is nothing wrong with doing these things or being a bargain hunter, I have many friends and family who are bargain hunters and I love them as people, but I would NEVER want them as a client. When my Mum and I had our salon we were the most expensive place for miles. People would question the price and we’d stick to our guns and simply demonstrate our high quality to them during every interaction. Salons opened in the same street many times over the years, usually copying our price list exactly, treatment descriptions and everything, but £5 or so cheaper across the board. Without fail they all shut down within a year. Sometimes we had clients who left, but their appointment got filled by someone else, or else they soon returned once they had experienced the difference in quality for themselves. You always want your clients to be secretly thinking, ‘Gosh, I would definitely still come for my nails even if they were more expensive.’ Your clients won’t be certain of this until they have experienced a poorer quality service from someone who isn’t as nice to spend time with as you are. So don’t freak out if they try another salon, it could be a big blessing in disguise. If your client has only ever been to you for a nail service they have no frame for comparison, and probably don’t realise how good you are, or lucky they are to have you. You can work out what would constitute a high end, premium price, by doubling the lowest recommend price given to you by your distributor. So again, to use the UK as an example, a very high end, premium price would be around £50.00 for a SHELLAC™ Manicure including removal. Now that we know this information, it’s much easier to work out where to begin with pricing. Let’s simplify things further by breaking down our industry into 3 categories, we’ll call them Discount, Standard and Premium. We will have a look at a definition of each, with a peek at the psychology and philosophy behind each business model. With this information, you can then decide which sector of the industry you personally want to be working in. A discount salon or Nail Pro is offering services at some of the cheapest prices in the area, though really anything from the distributor’s lowest recommend price and below is considered to be a discount service. They do lots of special offers in order to keep up (down) with other salons or techs who are offering discount services too. They are likely to (though not always) be using products with a cheaper wholesale price point. A discount service provider has a slim profit margin and has to fit in a lot of clients if they want to make a living from this business model, though with enough staff and a low enough cost per service, it is possible for a salon owner to make a living from this sector of the industry. They say that it’s a sign of any industry’s maturity and stability when it has a thriving discount sector, and my goodness the nail industry today certainly does. The average client who would use a discount salon would be someone looking for a quick, affordable service where they don’t have to book in in advance. The standard of quality they expect, or indeed how that client even defines what quality is will be quite different from what a client choosing to pay more would expect. This client, who is paying less for the service in the first place would tend to prize longevity of the service over any other factor – the longer their nails lasted them, the better value for money they got. The overall professional finish of their nails and the health of their natural nail underneath is likely to be less high on the priority list. Business operating in the discount sector of the nail industry are much more likely to see a high volume of clients at the busy times of year, when clients have occassions they want their nails done for, and will be much less busy at the quite times of year (Feb/March & Oct/Nov) when their clients are having a break. A standard salon or Nail Pro is offering services at a mid-range price. From the distributor’s recommended lowest service price and up, to a maximum of about 50% more. Expect a comfortable, clean environment, and services performed by someone who has all the relevant training, qualifications and insurance, who is most likely very proud of this and will be displaying certificates and discussing the quality and extent of their education with their clients too. A Nail Pro in this category can make a very respectable living and has a lot more freedom in terms of the volume of clients they see per week. A standard salon’s prices will be too high for some potential clients (no worries, that’s what discount salons are for), while being too low for others, but in general we find the largest pool of potential all-year-round regular clients to be seeking out services in this sector. A standard range salon will be kept going all year round with regular clients, there will be some seasonal effect, but far far less than would be experienced by a discount salon. A premium salon or Nail Pro is offering the most expensive services in the area, somewhere around 100% more (double) what the distributor’s recommended lowest service cost would be. There is no question that there are less potential clients out there who would seek out services at this high a price from this sector, but it takes far fewer clients to make a great living at this level because of the higher price charged for each service. The Nail Pro can spend more time with fewer clients while capitalising on her/his own ultra high skill level and innate gift for exquisite customer service. View this standard nail salon sample price list brochure full size by clicking here. 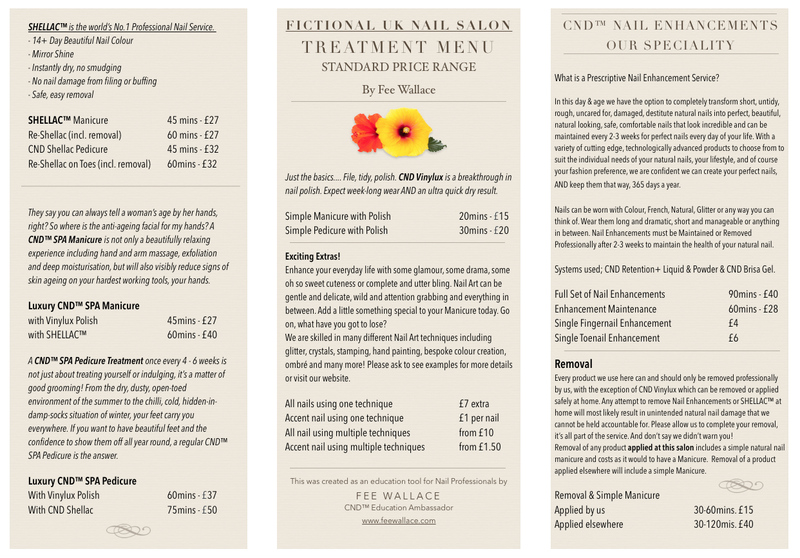 This is a good average example of how one could construct a price list and treatment menu for a nail business in the standard sector of the market. In this fictional salon the Nail Pros use CND™ products and have followed roughly, the recommended pricing as set out by the UK distributor, Sweet Squared. Please feel free to use any part of this if you think it would be suitable for your own needs. I created it in a computer program called ‘Pages’ which is a bit like ‘Word’ but on a Mac, using a standard template they had for a brochure. 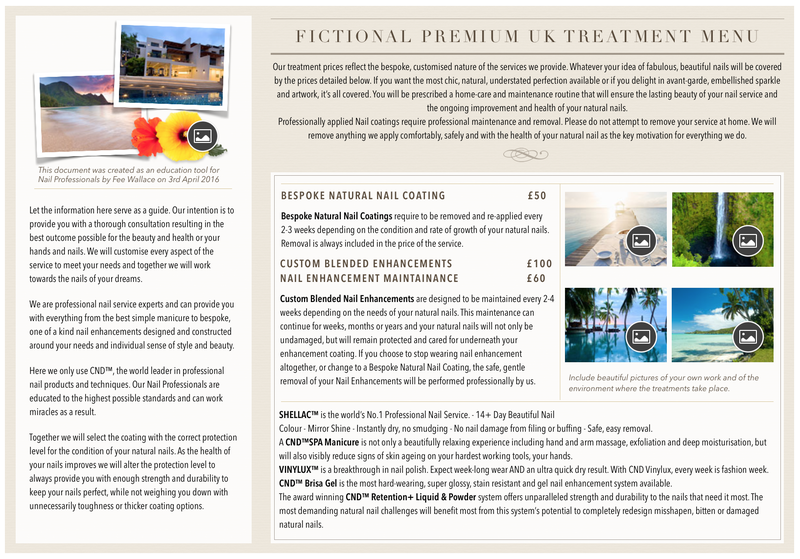 View this example premium nail salon price list treatment brochure with treatment descriptions in full size by clicking here. At the higher end of the pricing scale, this is an example of a treatment menu for a premium priced business. You’ll notice a few key differences between this and the previous, standard price list. Firstly, it’s much more simple, far less detailed in terms of breaking down precisely what they are paying for in pounds and pence, but far more detailed in terms of demonstrating the overall level of quality, skill and luxury the client can expect from the entire experience. This is what the premium client is looking for. Over the bulk of my career as a Nail Professional, I mostly charged in the style of the standard price list, lots of different prices for each individual thing, depending on how many nails they got etc. But when it became the case that the majority of my clients always had some form of art, every single time, or were simply quite obsessed with simple, flawless perfection, I felt it time to simplify things and change the way I charged. I increased the basic service cost by the extra amount spent on art or extras by the average client for my nail services across the board and stopped charging extra for art or embellishments at all. Among my Nail Pro colleagues this was a wee bit controversial, but my clients loved it. The way I see it is each client is coming for perfect beautiful nails, everyone’s idea of what that is is different, but each client pays the same premium price, and the cost to me for extra time and product is absorbed by that higher price. I have found that clients who are attracted to me because of my high price can’t be bothered with ‘oh it’s this much extra for this, and this much extra per finger for this..’ they would just rather is was one higher price regardless. A lower basic price is more likely to attract the type of client who would quibble over a couple of pounds and pence for art work, and our colleagues working at the discount end of the market know this daily battle better than any of us. It’s yet another reason I would not recommend deliberately choosing to operate your business in the discount sector of the nail industry. Now I’d like to address a particular category of Nail Professional. This Nail Pro has done all the training, research and practice of a standard to premium Pro, but is trying to run a discount business because they don’t feel they have any other choice. These Pro’s are convinced that a higher price will frighten off clients, but what they don’t realise is that their current discount price is what is frightening off the RIGHT type of client. And honestly, I don’t care what area you are based in, it has been proven to me again and again, if you want an appointment book full of devoted regulars who’s business you can rely on all year round like clockwork, you MUST at least be charging the lowest recommend price for a standard service, EVEN IF that makes you the most expensive Nail Pro/Salon in your area. A discount price is off-putting to everyone except a bargain hunter, and like I’ve said many times, bargain hunters don’t make good clients. Are you increasing your prices annually? Give your clients 6+ weeks notice of the impending price increase, no one likes to turn up and be expected to pay more out of the blue. Post a friendly letter in a pretty frame on your nail table or receptions desk. Only increase the price of your most popular services every year. If clients rarely book in for a Luxury Spa Pedicure no need to make that more expensive every year, but if you do mostly SHELLAC™ Manicures and Pedicures, those are the services that should be increased in price every year without fail. Increasing annually means you only need to up the price by a pound or two, leaving it longer means a bigger hike, and no one wants that. Always do your price increase on the same date each year without fail. Your regular clients will be absolutely fine with it and know it’s coming. Be ready to have a joke with your clients about it. You: ‘This small price increase is necessary so I can go on offering you the unparalleled, high quality of service to which you have become accustomed dear client!” Client: “You got all new flooring in here this year, is that what I’m paying for?? We clients didn’t need you to get a new floor!” LOL, etc. Do not feel threatened. If a client (or anyone else for that matter) claims you are being greedy and unreasonable because you are upping your service price by £1 per year, that client is a bargain hunter, do not barter with her, bargain hunters are not the type of client you want. If they stop coming to you because of 1 pound, you have a space for someone in your appointment book who is seeking out a higher quality of service and is willing to pay for it. Do not allow anyone to convince you to make an exception for them. Explain that the price increase is universal, and that all your clients are regular and loyal, so the price increase must apply to every single client across the board, even friends and family. Special Offers – a helpful business building tool or a monster with 3 heads that is coming to eat you up? It is my intention to write a future blog post entirely about this very subject. It can be a tricky issue to navigate and a challenging business tool to use properly. Here are some basic pointers on special offers for now, but stay tuned for a more in-depth analysis and barrage of unsolicited advice from me coming soon. Never ever, ever do a special offer on your most popular services. As a rule, do not discount services to first time clients. Offer reward schemes to regular clients only. Signing up to online voucher schemes is seldom the right course of action for a small business. Donating vouchers to local charity and community events whenever you get the chance is a great way to raise your profile locally. Yes it means a random someone gets a free treatment, they may well never come back and pay for one after that, but you got the chance to show that your business is part of the local community and cares about the causes your potential new paying clients also care about. 3426 words?? Well done dear reader! thanks for sticking with me. This has been my first massive essay of a blog post, I chose this topic because I am crazily passionate about helping Nail Pros understand this side of the work we do. So many talented Professionals end up not making the most of their abilities because they sell them selves short and lose out on the business that’s out there waiting for them, if only they put them selves into a different sector of the market place. I hope you have found this useful or at least interesting, thank you for taking the time. I’d love to know what you think in the comments below or over on Facebook. P.S. I am not an employee of either Sweet Squared or CND™ though I do work with both organisations and represent them in teaching roles. Everything I have shared here is my own opinion and advice and does not necessary represent the opinion of Sweet Squared or CND™ as a company. I personally choose to use SHELLAC™ and other CND™ systems for my own nail business because I know them to be of the highest quality, with the best customer support of any brand in the industry. Fantastic blog Fee, I’m berated for my slightly higher than standard salon prices by many local discount salons but don’t let them bother me. This is a great article. I sometimes feel I need to justify my ( standard) pricing against all the cheap nail places. Have to hold your ground! Thankyou Fee i am a returning nail tech and just trained in the shellac im loving it. About to open my first salon whilst working ftom home currently. I can certainly relate to everything you said and will putting the correct prices in place from the get go. I agreed with suzi,s thought. In the post here you can get some tips that how you can charge for professional services?